When you first spot signs of mold in your home, your initial reaction may be to grab your bottle of bleach and attempt to kill and stop the mold dead in its tracks. This may be because other sources claim that bleach is the perfect solution for mold when it is not. The truth is that using bleach to try and kill mold is actually one of the worst things you can do. In fact, both the EPA and OSHA have stopped recommending that bleach is used as a method to rectify mold. This is because bleach can kill some mold, in some places, sometimes. In other words, bleach is not necessarily the safest or most effective method for treating mold. Bleach can work on hard, impermeable surfaces, such as a bathtub, shower surround, or tile. Because mold spreads its roots, bleach is not effective on porous surfaces, such as drywall. Here are 4 reasons, why you should not use bleach for mold removal around your home. Commercial bleach contains up to 90% water and when applied to a porous surface, the chlorine quickly evaporates, leaving behind water. This excess water that is left behind is soaked up by the porous surface, encouraging mold growth. So, when you use bleach, you can unintentionally be making your mold problem worse. When bleach is applied to the mold, the surface can appear to be clean, giving a false illusion that the mold has been killed and cleaned. The reality is that the surface might appear clean, but the roots will continue to grow beneath the surface. Not only does bleach give the false illusion of removing mold from your surfaces, but it can also have adverse effects on your surface. For example, when chlorine bleach is applied to a wood surface, it will start to weaken the wood by breaking down the fibers. When bleach is applied to a metal surface, almost immediately the metal will start to corrode. Therefore, not only are you not able to effectively kill the mold, but you can also be compromising the structural integrity of your home as well. 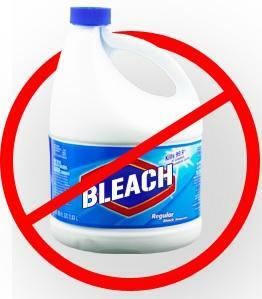 Bleach was designed to be a successful sanitizer, bleach must be used on clean materials or surfaces. It is for this reason that when bleach products are used in the laundry, they are used after the wash cycle. Both light and heat work to compromise the integrity of the sanitizing properties of bleach. While the odor of the chlorine will remain and linger long after you’ve used the bleach, the strength of the cleaning properties fades quickly, losing its strength and residual effect. As a result, bleach does not prevent the future bacterial or fungal growth of mold. If you have mold growing in your home, don’t attempt mold removal yourself. Instead, contact trained professionals, like those at Entrusted, to effectively kill and remove mold from your home. My name is Aly and I would like to know if you would have any interest to have your website here at entrusted.com promoted as a resource on our blog alychidesign.com ?